March 29, 2013 at 6:00pm until April 1, 2013 at 2:30pm in PDT. 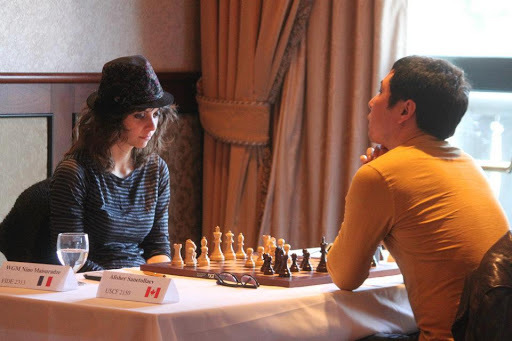 The Grand Pacific Open is BC’s largest chess tournament and this will be its 7th annual! The main event is a 6 round FIDE and CFC rated Swiss with $5000 in prizes. There are also a number of side events which are free if you play in the main event and include an active tournament, Midnight Blitz with $100 in prizes, and a Bughouse tournament to finish off the weekend. ‘Ho hum, another year, another record attendance at the Grand Pacific Open to go with this year’s record guaranteed prize fund of $5000. This year’s attendance of 120 flew by last year’s record of 104 with players from (give or take) five different countries, seven different states, and four different provinces. An added attraction was the participation of GM Hikaru Nakamura, 6th ranked in the world. It is not common for a weekend tournament such as the GPO to have such a high profile name – this was a rare opportunity for BC players to see one of the best in the world in person in action. Top BC Player (qualifies for BC Closed): Lucas Davies. U2100: Benedict Daswani (Trophy), Jason Cao, Janak Awatranami, James Chan, $200 each. 4 points. Top Women (Courtesy of Goddess Chess): Nino Maisuradze $80 5 points, Becca Lampman $70 3 points, Lan Ma $70 3 points, Alice Xiao $60 2.5 points, Polly Wright $50 2.5 points, Jill Ding $40 2 points. Top Junior (Courtesy Yaron Gvili): Tanraj Sohal, Lionel Han $50 each 4 points. 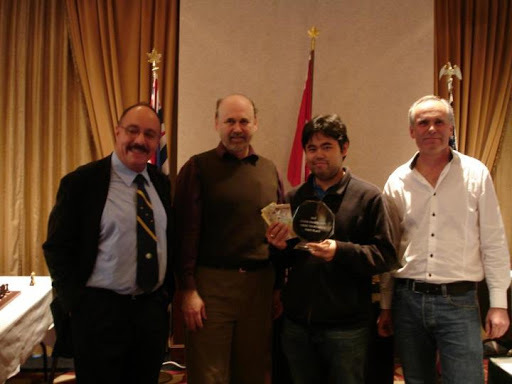 Here they are with 1st place finisher GM Nakamura, who is now playing in the London Classic 2012.